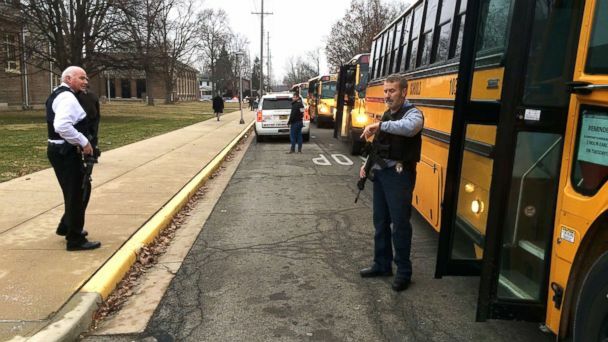 After a tipster reported a "potential violent act" that might occur at an Indiana middle school, officers confronted a 14-year-old gunman, who killed himself but didn't harm any others, according to police. "That likely prevented a lot of lost lives," Indiana State Police Superintendent Doug Carter said of the tipster. There's "no doubt in my mind... we'd be having a much different conversation" if that call wasn't made, Carter stressed at a news conference. When the tipster called police around 8 a.m. Thursday to report potential violence at Dennis Intermediate School in Richmond, the school was locked down and officers were sent to the scene, the Indiana State Police said. After officers confronted the teen outside the school, the gunman "reportedly shot out the glass of a locked entry door" and ran inside the building, police said. The teen, who was not a student at the school but lived in the area, exchanged gunfire with the officers as they followed him, police said. The 14-year-old died of an apparent self-inflicted gunshot wound, police said. It's not clear if the suspect was wounded by officers, police added. No students were hurt, police said. As the students were evacuated from the intermediate school, their worried family members rushed to the scene. "We're worried sick," Anna Martinez, the parent of a 10-year-old girl, told ABC Indianapolis affiliate WRTV. "There are over 100 parents here freaking out." "You wouldn't think [in] a small town like Richmond this would happen," a student's grandmother told WRTV. "I don't know what's wrong with this new generation." "My heart is aching for all these parents," the grandmother added. "This is not OK," Carter added of the shooting, but said, "you will be extraordinarily proud of the staff at this building." Because "someone knew something and said something," added Indiana State Police Sgt. John Bowling, "the school was able to follow procedure to help protect students." Richmond Community Schools Superintendent Todd Terrill said he's thankful all students, staff and officers are safe. Terrill said students, staff and teachers -- who have undergone drills -- responded appropriately. "It breaks my heart to be here," Carter said at a Thursday afternoon news conference. "There is no simple answer," he said. "Until we change the way we view violence, we're never gonna get any better. "